The epic story of Jet Black reaches its final stage as many unseen things are revealed. Dreadful things are coming that will change the world and threaten the existence of all those who dwell upon it. But one question demands an answer.... When? Some people in high places think they know. They believe they have a plan to protect themselves, and all their material wealth. Are they correct? Or have they made a fatal assumption? The one called Balance knows the truth about what's really coming, and it becomes clear there is only one way humankind may be spared. The circle of trust grows as the rest of Grandpa's story is told, and a new light is shed upon the nature of humankind's mortal existence. 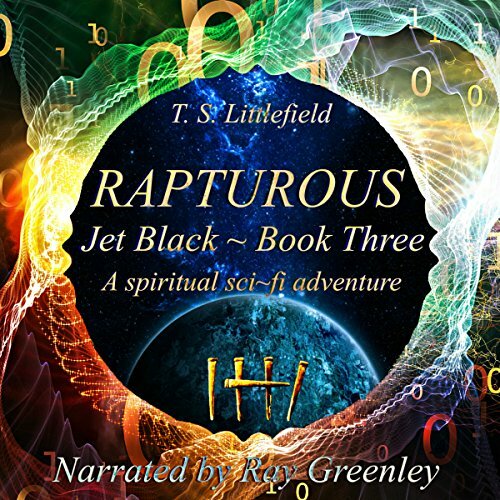 Rapturous is the final release in the Jet Black trilogy, a spiritual science fiction adventure written for young adults and older listeners alike. Warning: This book series will take you on an adventurous ride through the world of Jet Black. Here you will inevitably find various religious and spiritual undertones woven into the story. Some of these are subtle, some are not. Others are hidden as clues to a larger picture. While some listeners may value these as hidden treasures, others may choose to see them differently. If you are easily offended by religious and/or spiritual content, I suggest you turn back now. If however, you are not afraid of such things, by all means.... Proceed at your own risk. Loved this book, and loved the series. I highly it for a good, clean young adult read. A true meaning of life. What did you love best about Rapturous? It was great to revisit these characters and see how their story ended. I like that it wraps up the loose ends and has a happy ending. What other book might you compare Rapturous to and why? Probably C.S. Lewis Space Trilogy because of the connection between sci-fi and theology in this book. That's a very different book series than Rapturous, but they do have some things in common. Greenly again does a great job bringing these characters to life, especially some of the female characters that are new (or at least more prominently featured) in this book. This book was an interesting amalgamation of sci-fi and theology. It brings in some Judeo-Christian history and theology into the book without being "preachy"; more of a "shared history fiction," if you will. Overall it was an easy and quick listen. this book was very hard to get through. for me it didn't do a great job of holding my attention. lots of time spent on the details and too many religious parallels. if I wanted to read a book on religion I wouldn't have picked a fiction-sifi book.